(CN) – As President Donald Trump begins the third year of his presidency under Democratic oversight in Congress, the Pew Research Center reported Friday that confidence in the economy is stable but the American public is losing trust in the leader of the free world. In a survey of 1,500 adults between Jan. 9 through Jan. 14, Pew researchers found that 58 percent of respondents said they trust what Trump says less than previous presidents, which has crept up from 51 percent in February 2017, shortly after Trump took office. In tandem, 59 percent said the Trump administration’s ethical standards were “not good or poor,” according to the survey. Only 39 percent of respondents felt that the president’s ethical standards were up to par, which is 5 points lower than President George W Bush in June 2006, when favorability over the Iraq War had begun to sour. However, the survey also reflected the hallmark stark partisan contrast of recent politics on the question of trustworthiness. Ninety-four percent of Democratic respondents said that they trusted President Trump’s statements less than previous presidents, while 58 percent of Republicans said they trusted his statements more. Similarly, 78 percent of Republican respondents said they were at least “somewhat” confident that the president kept his business interests separate from his presidency, whereas 89 percent of Democrats said that they were at least “not too” confident that the separation existed. Overall, a 57-percent majority said they were not confident in the president’s ability to separate his business interests from his presidential decisions. Additionally, though only 32 percent of Republicans said the president should release his tax returns, an overwhelming 91 percent of Democrats felt the same. 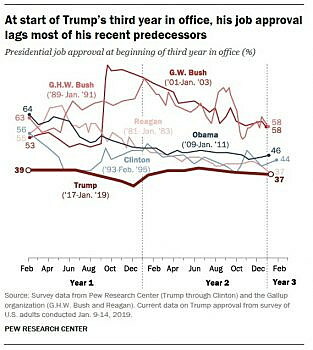 Overall, 37 percent approve of Trump’s job performance while 59 percent disapprove, matching only Ronald Reagan’s low approval rating at this point in his presidency. Despite the trust deficit shown in the survey, the president remained on steadier ground on the economy. A 40-percent plurality said that they thought the economy had improved since Trump took office, which was up from 29 percent in October 2017. That number was primarily bolstered by Republican respondents – 79 percent said that the economy has improved, a 16-point increase from the first year of the Trump presidency. Additionally, a 60-percent majority said local jobs were more readily available in their communities, and only 33 percent said jobs were hard to find. Though Republicans are more likely to regard the job market positively (71 percent), a 53-percent majority of Democratic respondents also felt good about the current job market. Republicans were overwhelmingly confident in the president’s ability to govern on a variety of issues – Trump polled in upwards of 80 percent approval on issues such as international trade, the economy generally, federal appointments, the military and immigration. However, 70 percent of respondents overall viewed the president’s ability to work with Congress effectively as his weakest trait. Friday’s marks the 28th day of the partial government shutdown, the longest in U.S. history, as negotiations between Democrats in Congress and the president over funding for a wall on the southern border have broken down. Despite the positivity about the economy, the stalled negotiations on border security and Trump’s trust problems have lent themselves to the notion that his administration will not be seen as successful. At the beginning of Trump’s presidency in January 2017, 58 percent of respondents in a previous Pew survey said that it was “too early to tell” if his administration would be viewed as successful. Two years later, only 23 percent felt that it was too early to tell, and a 47-percent plurality said that the administration would be viewed as unsuccessful. Part of the confidence disparity could stem from views on Special Counsel Robert Mueller and his investigation into the Trump campaign’s potential ties to Russian meddling in the 2016 election. In the survey released Friday, 54 percent of respondents were confident that Mueller’s investigation was fair. Meanwhile, 60 percent said they had little to no confidence in Trump’s ability to handle the investigation appropriately. Trump’s stance on impeachment – a word that has haunted the majority of his time as president – seems based on the positive markers seen in the survey. Nonetheless, rumblings of impeachment proceedings began Friday after BuzzFeed News reported that Trump instructed his longtime personal attorney and “fixer” Michael Cohen to lie to Congress about Trump Tower Moscow negotiations. In response to the report, the chairman of the House Intelligence Committee, Representative Adam Schiff, D-Calif., tweeted Friday that the president “may have suborned perjury” before the committee, and that it would “do what’s necessary” to uncover the truth. Though respondents in the Pew survey showed a clear confidence in the economy, their overall lack of trust in Trump himself could leave him vulnerable in the fallout of the latest scandal.